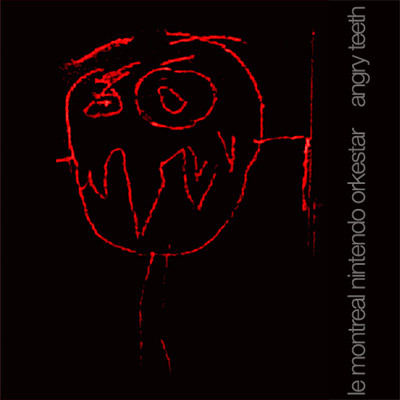 The latest release from the Montreal Nintendo Orkestar, titled “Angry Teeth”, begins to sound more experimental, with several unpredictable surprises. Six tracks packed tightly inside a 3″ CDr offer various directions of thematic ideas, while maintaining a solid musical agenda. We have field recordings, live recordings and sampling who together build a mini album of dreamy landscapes and eerie notions. It begins with a hypnotic, almost sleazy set of waves. It’s the kind of sound waves that you can find in old science fiction movies, predicting an ominous intention of a powerful villain. In this album though, these wave, the building blocks of the first track, are causing my head to slowly move back and forth, at first without even me noticing. “The Third Gallilean Moon of Jupiter” is an epic, stellar journey of vibrating sounds. It ends suddenly, giving way to more subtle and eerie meditative sounds of the following parts. As I hear drifting, talking voices, along with metallic percussion sounds, this entire experience sounds like a dream to me instead of a concrete experience. I like the way MNO seem to lose their connection with reality, as time goes by and more albums are released. With the current pace of their releases, and if this direction is being kept, their detachment can produce some wonderful results!